The PHS51P is a 5.1 home theater speaker kit from Pyle. It’s perfect if you’ve got a receiver but no speakers, or if you want to get your speakers separately from your receiver. Start with the subwoofer. 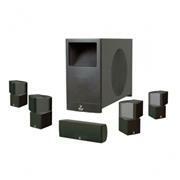 It’s equipped with a 10” long throw driver, passive crossover network, and a booming frequency response of 50 to 330 Hz. The four satellite speakers and central speaker are constructed from piano black ABS plastic for a clean look. And all the satellite speakers are magnetically shielded, so you needn’t worry about damage to your other equipment. This 5.1 kit will envelope your living room in surround sound, making television, films, and sports truly interactive events.